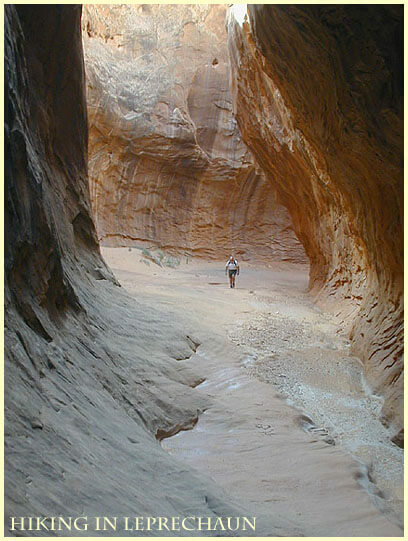 This hike heads up an unlikely-looking canyon that soon narrows into a nice slot, then narrows even MORE! At the junction with the East Fork, the vigorous canyoneer has a couple of options. A bit of climbing leads up the East Fork to an "inscription chamber" where people have left their names scratched into the wall over the last 50 years. A bit of sideways shuffling up the Main Fork leads to the slot called "Belfast Boulevard". This is a good place to evaluate your skinniness. Belfast Boulevard is not particularly skinny by Leprechaun standards, so if you think this is tight, you will definitely struggle descending the Main Fork from above. From the road, Leprechaun is a wide canyon with a bunch of reeds in it, and a "Chess-man" pinnacle in about 1/4 mile. There is a short dirt road on the right (east) side of the canyon mouth, that leads to a short sand-trap road. Park on the solid road close to the highway. The road is off Highway 95, 2.0 miles east of the intersection with Utah 276. Hike into the canyon, following trails-of-use through the reeds, or crossing the stream and climbing up on the slickrock to the west. Past the Chess-man pinnacle, the canyon starts to narrow up and the hiking surface changes to slickrock. A short section of narrows can be climbed-through directly (fun! ), or passed with some difficulty on the right. Soon the canyon narrows again and forms a Subway section. A bit further, the canyon really narrows to a slot. Exploring up the East Fork (to the right) leads shortly to the bottom of a rappel, and a fun chamber where many people have inscribed their names. Slither back down to the Main Fork. Exploring up the Main Fork (straight ahead) leads immediately to a narrow slot called Belfast Boulevard. It is possible, though strenuous, to climb UP the chimney of Belfast Boulevard and continue up to the junction of the West and Main Forks. Shuffle sideways into the slot almost to the end, then chimney up to gain the top of some chockstones. Climb across the top of the chockstones, then under another boulder to pop out into the canyon. A headlamp is pretty much required for this.